I’m in berry heaven. This time of year strawberries are in season. Sure, you can get them all year round but they just don’t taste as good. 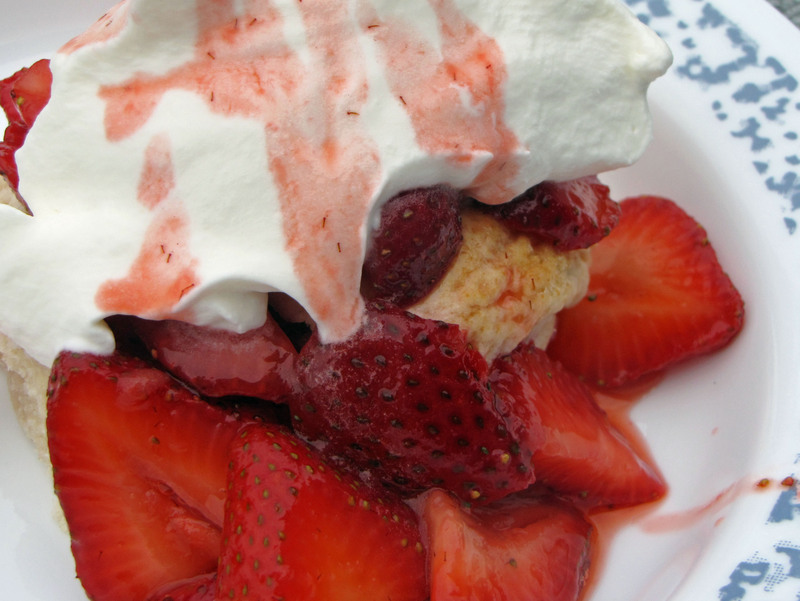 One of our family favorites is Strawberry Shortcake. We make ours by slicing strawberries, layering them between two sweet biscuits and topping with real home made whipped cream – yum! Making your own biscuits and whipped cream makes this dessert extra special. In a rush? No problem. Pick up some pound cake, layer with strawberries, add some whipped topping and you’re good to go. Preheat oven to 425F. Combine all the dry ingredients in a mixing bowl. Stir together. Add butter, shortening and ‘buttermilk’. Use a mixer to combine all ingredients until just combined. The dough will be sticky. Turn dough onto a floured surface and shape into a 1” thick rectangle that’s about 4” wide and 9” long. Using a sharp floured knife, cut into eighths. Place closely together on a baking sheet and bake until golden. Slice berries. Add lemon juice, sugar and Grand Marnier. Stir to combine. Let sit for at least 15 minutes. Combine all ingredients in mixing bowl and whip at high speed using the mixer’s whisk attachment. Be careful not to overmix – you don’t want to end up with butter!